All the Bonds. All the girls. All the action. All in high-definition. 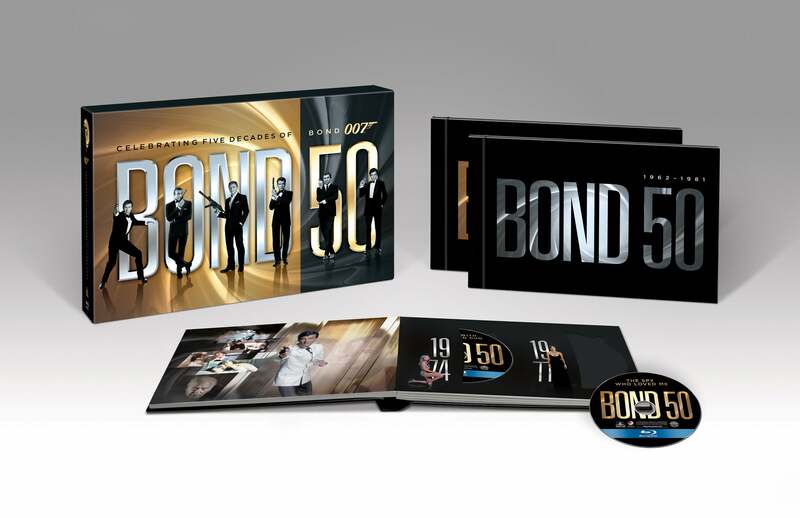 Metro-Goldwyn-Mayer Studios and Twentieth Century Fox Home Entertainment mark James Bond’s monumental golden anniversary with the release of BOND 50, showcasing 22 of the classic Bond films on Blu-ray together for the first time ever, neatly packaged into one cool, sleek collectable box-set. The collection marks the debut of nine James Bond films previously unavailable in high definition Blu-ray and comes with a dossier of more than 122 hours of bonus features. BOND 50 also offers a look at the latest Bond film, SKYFALL, through videoblogs shot with the cast and crew. The BOND 50 collection provides two all-new pieces that spotlight the history of 007. “The World of Bond” takes a look at the style and attitude that is signature to Bond; pulling together the cars, the women, the villains and the music that have been a staple of these films for the past 50 years. “Being Bond” profiles the six distinguished actors that have had the honor of portraying 007.